The importance of hearing cannot be overemphasized and surveys suggest that as many as 80% of people with Down syndrome will have some problem with hearing. The vast majority of children acquire language primarily by hearing what is being said by those around them, and good hearing is involved in the development of speech and language as well as socialisation. These, as well as other factors, have a profound effect upon the general intellectual development of the child. The early detection and treatment of hearing deficits is, therefore, essential for the child with Down syndrome. Before we look at the problems associated with Down syndrome, let us consider the normal working of the ear. Sounds, which are pressure waves in the air, travel along the external auditory canal where they meet the eardrum. This is the gateway to the middle ear, an air-containing cavity containing a chain of three small bones (ossicles) which connect the eardrum to the oval window. The sound waves cause the eardrum to vibrate, which in turn produces movements in the ossicles. This produces vibrations on the oval window (a small membrane separating the middle ear from the inner ear). These pass through the fluid in the inner ear and then stimulate the hair cells of the cochlea differentially, depending upon their frequencies and pressures. At this stage, the information contained in these pressure changes is transformed (transduced) into nerve impulses, which travel along the acoustic nerve via complex routes to the brainstem and brain, where sound is perceived. Anything which interferes with any stage of this transfer chain will affect hearing. On average, the air pressure in the middle ear is the same as the surrounding atmospheric pressure and this is regulated by the Eustachian tube which communicates between the middle ear and the upper part of the throat. Conductive loss: This is common, and is caused by interference with the function of the middle ear by infection (Otitis Media) and/or glue ear. However, excessive wax or other foreign bodies can also cause obstruction of the outer ear canal. Balkany  suggests that middle ear problems account for 83% of hearing loss in children with Down syndrome. Sensori-neural loss: This occurs when the cochlea or the acoustic nerve is damaged. There is evidence to suggest that this type of loss increases in later childhood  and this is a good reason to continue with routine assessments even if a child does not show signs of conductive loss. Some children have a mixture of sensori-neural and conductive loss. Wax in the external ear canal may interfere with hearing and can be softened with eardrops or removed by syringing or use of an appropriate instrument. The latter procedures must be performed by an experienced professional. Glue Ear is one of the commonest conditions involving the ear and has a particularly high incidence in children with Down syndrome. A mucoid secretion accumulates in the middle ear and stops the ossicles from vibrating freely, therefore reducing hearing levels. Children with Down syndrome tend to have stickier 'glue', which is less likely to drain away, and more likely to become infected. The Eustachian tubes are often less effective in allowing drainage from the middle ear, as they tend to be narrower in children with Down syndrome. 'Glue ear', and the associated hearing loss it causes, tends to fluctuate across time and certainly children seem to be less affected in the warm summer months. Glue ear can be treated in three ways: insertion of grommets (called pressure equalisation tubes or PETS in the US), microsuction and tonsillectomy and /or adenoidectomy. The insertion of grommets in the eardrum allows the fluid to drain out of the middle ear into the external auditory canal. Grommets are tiny tubes with flanges at each end, which are inserted through the eardrum, allowing the glue to drain out. This is very effective as long as the grommets remain in position in the eardrum. They do become extruded (pushed out) after about three to twelve months but they are almost always helpful in allowing drainage and therefore improving hearing. We shall return to the use of grommets in our evaluation of the benefits of screening and intervention. Drainage from the middle ear can also be achieved by perforating the eardrum with laser apparatus. These perforations tend to heal fairly quickly but many clinicians feel that this is a very worthwhile procedure for draining the middle ear. Microsuction involves sucking the fluid out of the middle ear using a thin needle which is inserted through the eardrum. This usually has to be repeated several times but can be very effective. It has the advantage the there is no discharge into the external auditory canal to be dealt with. There is anecdotal evidence to suggest that a milk-free diet may help to reduce mucus production that leads to infections and glue ear. Dr Jennifer Dennis from the Down Syndrome Medical Interest Group suggests that parents try a two week trial and, if this is successful, seek professional advice on maintaining a balanced, milk-free diet. We feel that treatment of glue ear for children with Down syndrome is imperative. Various authors imply that untreated glue ear in children with Down syndrome may cause permanent changes in the functioning of the middle ear. Marcell discusses reduced mobility of the eardrum in 40% of a sample of young adults which may have resulted from years of untreated glue ear. Balkany indicates that there may even be a permanent change in the mobility of the ossicles. Middle Ear Infections (Otitis Media) are particularly common in children with Down syndrome. This is due to the problems of poor drainage of the sticky glue and the fact that people with Down syndrome are more susceptible to infections of all kinds. The treatment of middle ear infections usually involves antibiotics and, potentially, one of the interventions listed above. Sensori-neural hearing loss is a poorly understood set of conditions in which the inner ear or cochlea malfunctions. The phrase is sometimes used to include problems in other parts of the central nervous system as well. It may be present from birth or develop in later life and the higher frequency tones are mostly affected. This may have a serious effect on understanding, since it is these frequencies which give speech most of its intelligibility. This type of hearing loss is often overlooked in the early stages because these children do not always behave as if they are deaf. They respond to many different sounds but tend to hear a rather low frequency rumble containing little real information. Those who can lip-read may sometimes be able to communicate to some extent. There is no cure in this group of conditions and those who benefit from the use of hearing aids continue to depend on them indefinitely. Having reviewed the range of hearing difficulties for children with Down syndrome, let us turn to the assessment of hearing. Children with Down syndrome should be tested in a properly equipped and staffed audiology center, as special testing techniques are sometimes required. 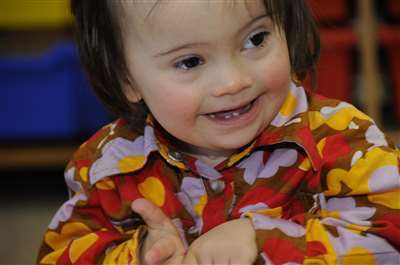 Where possible, children with Down syndrome should be tested by staff with experience of children with special needs. The following descriptions of the tests are intended as a brief introduction to the subject. Tympanometry, also known as Impedance or Compliance testing, is a commonly used test which allows the audiologist to check the movement of the ear drum under test conditions. It is painless although it does require some co-operation from the child. The test allows the audiologist to detect a possible cause of conductive hearing loss. 'Oto-Acoustic Emission Test' (OAE): This test is used in the British Isles to assess all infants shortly after birth. It does not require active participation from the subject and is, therefore, suitable for very young children. The test detects and analyses certain sounds which are produced by the inner ear, in response to the test equipment. Pure tone audiometry: This can be used if children are able to understand instructions and to respond when they hear a sound, e.g. by raising their hand or putting a peg in a hole. There are a number of versions of this technique, the principle of which is to test hearing by producing tones of known loudness and pitch in small increments. The child signals whenever he hears a specific tone and the responses are plotted on a chart - the audiogram (see below). There are adaptations of this test that are suitable for use with children with a range of more complex and additional needs. Following initial checks for newborns, a child should receive a full hearing check at about nine months of age, another at about 18 months and then annually until ten years of age. After the age of ten, testing every two years is considered sufficient. However, parents of children with Down syndrome should always ask for additional hearing checks if they feel that the child's hearing has altered in any way between routine appointments. A visit to the audiologist may result in an audiogram (see Figures 2, 3, and 4), a visual representation of the specific sound pitches (frequencies) and loudness (intensity) levels that the child can hear with each ear. The audiogram covers the range of frequencies from 125 to 8000 Hz (cycles per second), and the range of loudness from zero to 100 dB (decibels). In Figures 2, 3 and 4, note how the frequency values along the top, double in value. Each value, from left to right is one octave higher than the last. The decibel values down the side are recorded in ten decibel increments. Perceptually, the sound seems to double in loudness every ten decibels. The audiogram shows the loudness at which the child can hear each frequency of sound. Hearing loss is often referred to as mild, moderate, severe or profound. The corresponding decibel ranges for these terms can be found in Figure 5. Sometimes you may be shown the hearing for each ear on separate audiograms. As a rule the left ear is shown by a cross (x) and the right ear by a circle (o). A person with normal hearing will have two lines (one for each ear) from the lowest frequency tested to the highest frequency, at the level of about zero decibels. Figure 2 shows the audiogram of a person with normal hearing in their right ear; notice how the line is straight showing no deviation from the zero grid line until the high frequencies. This means that for all the frequencies apart from the higher ones, the person is able to hear the sounds even when they are very quiet. Figure 3 shows the pattern for a person with a mild conductive loss of about 35 dB. The line starts at about 40dB showing weakest hearing for the lower frequencies and then levels out at about 35dB. Figure 4 is an audiogram for a child with a sensori-neural loss, which becomes more severe in the higher frequencies. The information from the audiogram can be used in conjunction with the photocopiable 'speech banana' to determine which sounds the child will have difficulty in hearing. In very simple terms, you can see that higher frequency losses tend to affect consonant sounds whereas loss of lower frequency losses affect vowel sounds. Figure 5: Degree of hearing loss for children with normal development for ages 2 years and above (Shott, 2001). Note that a loss of only 16-25dB can have a deleterious effect on children with Down syndrome although it may hardly affect a typically developing child. Parents should not feel embarrassed if they do not understand some of the technical terminology used by professional staff and should always ask for clarification if this is needed. Box 1 contains some questions that you may wish to ask at your appointment. So far, we have explored the normal working of the ear and some of the problems associated with Down syndrome. We have noted that there are many effective interventions for ear complaints and finally we have outlined the assessment process itself. The ultimate question, however, is how effective are these interventions and what possible benefits are there for a child with Down syndrome? Specific speech and language delay, difficulties in auditory processing and poor phonological awareness are typical of children with Down syndrome. It is not hard to see how these delays could be intensified for a child with a hearing loss. Psychologists have discussed the connection between language and thought for many years. It is clear to see how much of our thinking takes place in a verbal form, sometimes we even say that we are 'thinking aloud' when inner speech becomes public! If one can make the connection between hearing, language and thinking, it is plain to see that it is vital that we intervene at the earliest opportunity, if there is a chance that a hearing loss could be detected and managed in a child with Down syndrome. Many studies have indicated a relationship between educational, language and emotional development and even mild hearing loss. Balkany showed that there was a statistically significant difference in the IQ of typically developing children with a mild hearing loss and matched controls. For children with Down syndrome who may be less able to compensate, even the slightest hearing loss may have deleterious effect on general intellectual development. What kind of tests will you be using and what are they used for? What did the tests show? Will the hearing change over time? Can the hearing loss be treated? Which sounds will be most affected and what can I do to help? How sure are you that the results are right? What do I need to do next and do I need to come back for more tests? Despite the clear need for routine screening, there is controversy with regard to the treatment of detected hearing losses. There is much anecdotal evidence linking the insertion of grommets and the extremely rapid advances in receptive and expressive language. However, Sally Shott, an eminent ENT specialist in the USA, has recently provided strong empirical support for their use. She conducted a study of 48 children with Down syndrome aged 2 years and under. She found that 83% of this sample required grommets due to chronic middle ear infections, 12.5% had occasional ear infections that were treated with antibiotics and only 4.2% had not had any ear infections. After her intervention, only 2% had a residual mild hearing loss. She advocates meticulous ear cleaning, examination and aggressive treatment starting soon after birth, for all children with Down syndrome. She speculates that this style of continued intervention may have a major impact on the development of speech and language. Some ENT surgeons are less enthusiastic about the use of grommets in children with Down syndrome because they feel that they are extruded more quickly and that continual replacement may scar the eardrum. They may recommend hearing aids instead of medical/surgical intervention. However, the authors feel that the many benefits of grommets, including effects of improved hearing upon language development, socialisation, general intellectual development and self-confidence, far outweigh the possible difficulties. In conclusion, one can see that children with Down syndrome are at particular risk of some degree of hearing impairment due to a number of physiological differences. There are a range of middle ear problems that can be treated successfully if the children are taken for routine cleaning and examination from birth. It appears that this may be vital for children with Down syndrome in order that they develop to their full potential. The article has also answered some of the specific questions about what to ask the audiologist and how to interpret the audiogram. Hopefully, this will lead to empowered parents and guardians who will feel confident that they can use the information they have been given about the child's hearing loss in order to capitalise on their child's strengths and sensitively address areas of weakness. Shott, S.R. (2000). Down syndrome: Common pediatric ear, nose and throat problems. Down Syndrome Quarterly, 5(2), 1-6. Balkany, T.J., Mischke, R.E., Downs, M.P. & Jafek, B.W. (1979). Ossicular abnormalities in Down's syndrome. Otolaryngology: Head and Neck Surgery, 87, 372-384. Davies, B. (1996). Auditory disorders. In B. Stratford & P. Gunn (Eds.) New Approaches to Down Syndrome. London: Cassell. (pp. 100-121). Dennis, J. (2001). Nasal congestion in children with Down syndrome: Action Sheet [online] Available: http://www.dsmig.org.uk/library/articles/nasal-congestion.html#160; [Accessed: 2003, September 8]. Marcell, M.M. (1995). Relationships with between hearing and auditory cognition in Down's syndrome youth. Down Syndrome Research and Practice, 3 (3), 75-79. [Read Online ] [Accessed: 2003, September 8]. Shott, S.R. (2001). Hearing loss in children with Down syndrome. International Journal of Pediatric Otorhinolaryngology, 6, 199-205. Balkany, T.J., Downs, M.P., Jafek, B.W. & Krajicek, M.J. (1979). Hearing loss in Down's syndrome. Clinical Pediatrics, 18, 116-118.